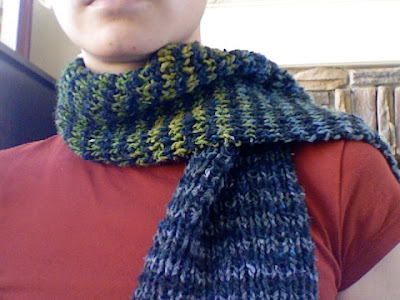 Notes: I cast on fewer stitches for this than for the first one I made--25 instead of 35, and I was able to get a reasonable-sized scarf-- 5" x54"--with just 2 balls, 1 of each yarn. I forgot to work the slipped stitch edging, so the edges are not as nice on this one, but I still like it just fine! 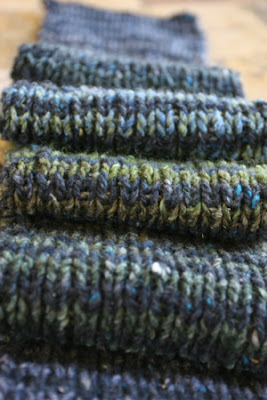 It's pretty conservative, as far as scarves from self-striping yarns go, which suits my taste and the receipient's. 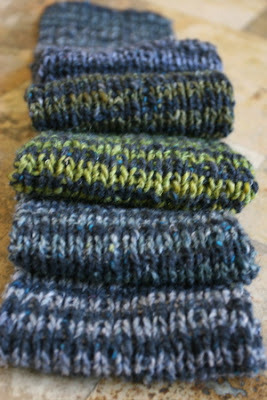 I like having the the repeating stripe from the dark aquamarine Kathmandu Aran to ground the color changes of the Noro.